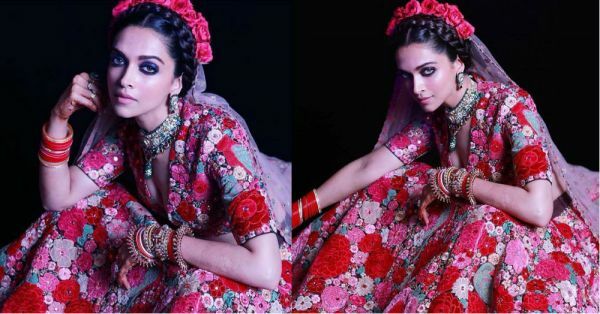 Ranveer Is The Reason Deepika Wore This Dramatic Sabya Lehenga! Everyone is talking about Ranveer's 'aww-dorable' speech, about how he married the most beautiful girl in the world, at the big post-wedding DeepVeer party last night. He also mentioned how Deepika had 'obliged me by wearing this today... she's looking like Freida Kahlo...'. We all know Ranveer is the crazy dresser between the two of them. 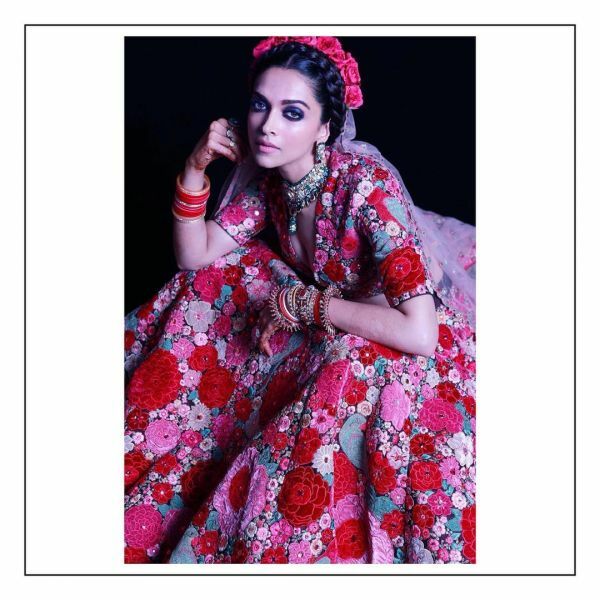 So, it was only right to think his style inspired Deepika's dramatic floral statement lehenga. And boy, are we glad it did! Even though Ranveer's new wifey didn't wear a custom Sabyasachi outfit as we'd expected, she did wow us all with her bold lehenga design. A set from the designer's newest bridal collection for 2018, Deepika's chosen ensemble caught our eye at the time of the launch itself. It's quite clear why, isn't it? 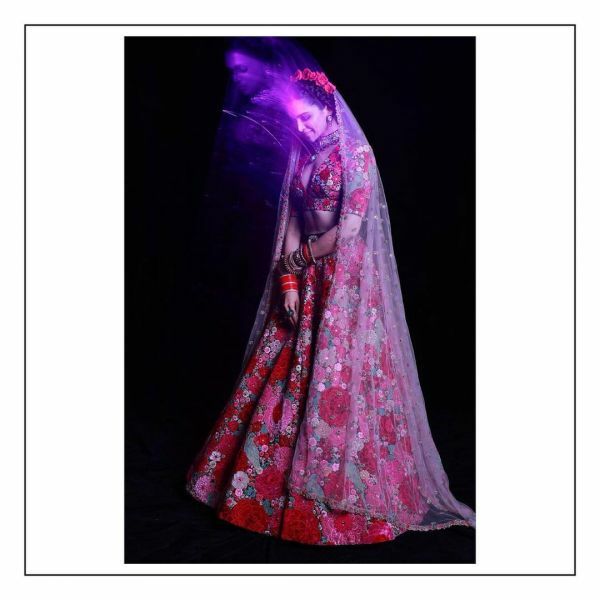 Decorated with floral embroidery depicting various kinds of blooms, Deepika's lehenga made the red and pink colour combination a wishlist topper for us. Deepika's lehenga blouse showed off her fit body and sensuous collarbones with a plunging neckline and structured tailoring. The heavily embroidered lehenga, though simple, was also tailored to perfection... And how could we forget the signature Sabya 'tiger' waistbelt? The iconic accessory enhanced Deepika's toned waist and also took her statement lehenga to the next level. As did her sensational Freida-Kahlo-inspired hairstyle. Straight off the Sabya runway, the updo featured thick braids across the top of Deepika's head and also a row of fresh red roses. And the embellished sheer dupatta was the cherry on top, wasn't it? P.S. Her jewellery has our hearts. Especially the edgy spiked kangan set she wore with her chooda. Not your regular bridal look, is it? Giving his bride some stiff competition was our dear Baba, wearing his favourite designer Manish Arora. A radical three-piece set, consisting of a black kurta, pants, and a bold, embroidered jacket, Ranveer Singh's glow-in-the-dark outfit also had a 3D cat mask on the shoulder. The dulha also made a statement with a layered metallic necklace around his neck and intense black kohl around his eyes. W-I-L-D. Couple goals for real, eh?